Star Wars Ultimate Sith Edition lets you experience the power of the dark side. 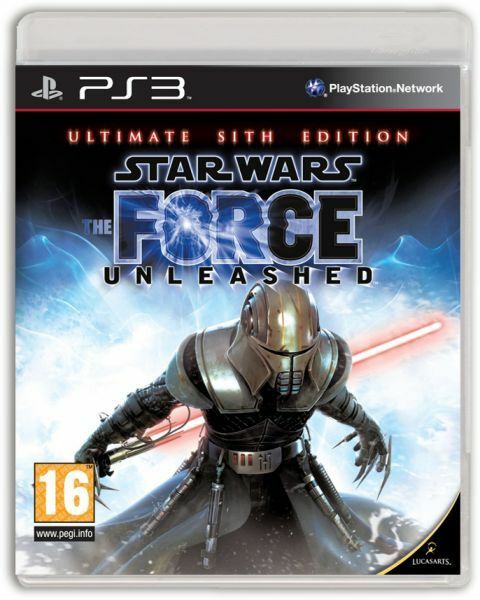 This Star Wars PS3 game is packed with intense in-game events.Star Wars The Force Unleashed- The Ultimate Sith Edition shows the gamers the darkest, deepest side of the force. The story of this game puts players on a collision course with the greatest Jedi, Luke Skywalker himself. This Star Wars PS3 game includes all of the original missions found in Star Wars: The Force Unleashed. Also, this edition includes three new levels to create the ultimate-evil storyline of the events that took place between the two classic Star Wars movie trilogies. This game re-imagines the Star Wars Saga as if the Darth Vader was killed by the Secret Apprentice and became the most powerful Sith Lord in the universe. Obi-Wan Kenobi has been hiding on the planet Tatooine ever since the events of Episode III Revenge of the Sith. In this Star Wars Ultimate Sith Edition game, the Emperor sends his new apprentice to dispatch Obi. During the hunt for the reclusive Jedi, players will also encounter notorious bounty hunter Boba Fett and explore the depths of Jabba the Hutt’s palace. In the thrilling finale of this game, the Secret Apprentice is sent to the planet Hoth on a campaign to destroy the rebellion once and for all. While visiting the iconic locations seen in Star Wars: Episode V, the players face the greatest Jedi, Luke Skywalker. The Force Unleashed PlayStation 3 game lets you experience the full power of the dark side of the force. Create devastating attack combos using the over the top force powers like grip, force push, repulse and lighting and the Secret Apprentice’s lightsaber. Leave a path of destruction behind you by upgrading and mastering these abilities. The Secret Apprentice does much more than juts using force to defeat his enemies. He smashes them into objects, shocks them with lightning, hurls them into objects and even transforms them into force charged bombs, which are capable of massive destruction.